I miss the silence: deafening silence punctuated by small breaths signifying flutters of life in a world swallowed by the sinking, seductive embrace of serenity. That type of serenity isn’t easy to come by in a city that moves faster than the speed of hope: it’s frenetic core blinked into existence by anxious dreamers. If I hold still, very still, for just a moment and close my eyes, I can paint my serenity memory on the backs of my eyelids. In this moment the world stops rotating long enough and my breath reverberates alongside the earth’s heartbeat. 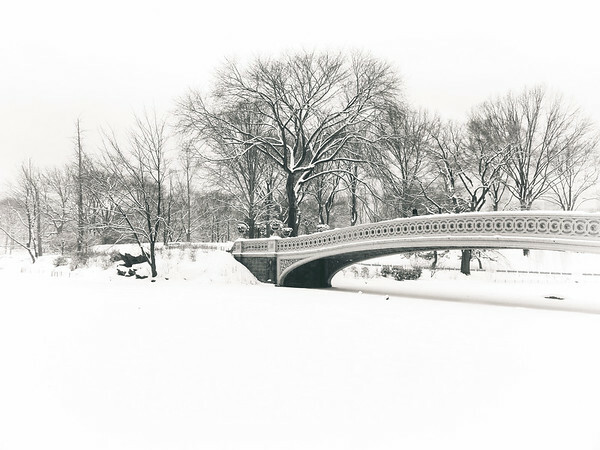 This is a view of the classic Bow Bridge in the middle of a snowstorm during the winter in Central Park, New York City.